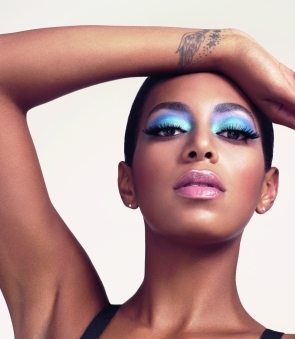 Solange Knowles is one of Rimmel London's new faces! makeup looks in campaigns which debut in the fall. Q: What’s your number one beauty tip? Be healthy, be happy, be beautiful, be whole-heartedly you! Q: Now you are the face of Rimmel, how do you feel about so many women looking up to you as a role model? I am very careful of ever putting the role model tag on my shoulders. I am human and I am expected to have imperfections and make mistakes. However, if there are positive things I do that inspire or influence people I feel like my purpose as a person is that much more fulfilled. When I announced my role with Rimmel, I felt really proud to see such a positive response especially being that I represent someone of color, a single mom, an artist...and that I don't have to compromise my views to do so! I love that photo with the bright blue eye shadow!